Tillie Jon Storyteller Bracelet size 6 5/8"
Tillie Jon is a versatile Navajo silversmith who makes contemporary-styled jewelry as well as Navajo Traditional Revival pieces. She also makes overlay jewelry like traditional storyteller bracelets. Here's a nice example of a Navajo overlay storyteller bracelet picturing traditional Navajo scenes from everyday life. 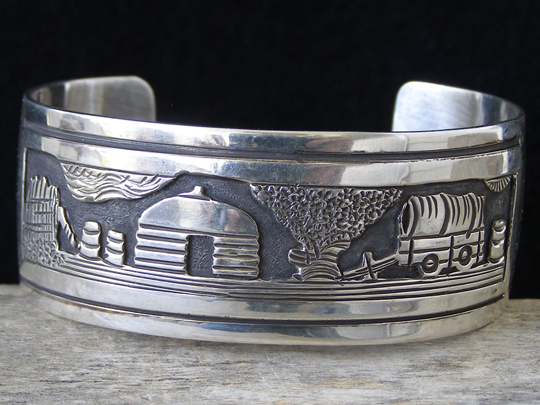 This bracelet shows a mesa, a hogan, a bread oven with smoke issuing from the top and a covered wagon. Nicely detailed! Hallmarked T. JON and stamped Sterling inside. Uniform width of cuff: 1"
Terminal to terminal: 5 1/2"
Total inside circumference (including gap): 6 5/8"